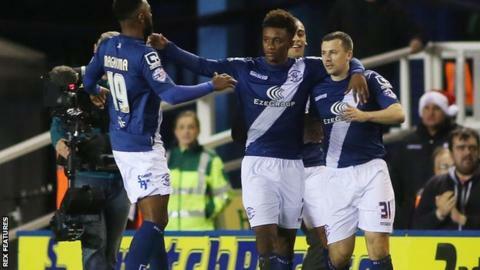 Birmingham City claimed a first home win in two months as a Paul Caddis penalty saw them beat Cardiff. He sent Cardiff keeper David Marshall the wrong way following a controversial handball decision against Matthew Connolly on the stroke of half-time. Marshall then denied Blues a second with the save of the match to deny Jon Toral, diving to his left. Cardiff missed several chances in front of a crowd of just 14,415, Birmingham's lowest of the season. Blues keeper Tomasz Kuszczak denied Scott Malone in the 89th minute - and other openings were wasted in a sustained spell of Cardiff dominance. From Malone's cross, Anthony Pilkington shot wide at the near post, Sammy Ameobi splayed a shot across the face of the goal when clear while home defender Jonathan Spector almost scored in his own net. Cardiff were forced into an early change following James Vaughan's block tackle on Sean Morrison, who was replaced by Bruno Ecule Manga. Blues also lost man before the break when injury-jinxed Neil Eardley was forced off after 26 minutes in only his fourth game back in the team - but it brought into the action Paul Caddis, who was to prove the match winner. It was a quiet opening 45 minutes but the game burst to life in first-half injury time. Cardiff keeper Marshall looked like he might have been impeded but, when the ball spilled loose, on-loan Blues striker James Vaughan's shot was blocked by Connolly and referee David Coote gave a penalty. However, replays suggested the ball had hit Connolly in the face rather than the arm. Cardiff boss Russell Slade was so incensed by the decision that he had to be restrained at the half-time whistle. Other than that, Kenwyne Jones might have done better with a header from a deflected cross, which Kuszczak saved comfortably to his left, while Pilkington had a left-foot shot deflected over. Cardiff also had more decent chances after the break - but it was Gary Rowett's Blues who held out for a second clean sheet in three games to leapfrog the visitors into seventh in the Championship table. "It looked like it might have hit him on the hand but, when you see the TV replay, it clearly hit him in the face. You have to be 100% sure with decisions like that. "To get that first goal, however fortunate it might be, was so important as it's been a while since we took the lead in any game. "We've had three games in six days and the lads were out on their feet second half. We've worked very hard to only get two points from the last two away games so, for us to play not as well we can and get the fortune is a great effort. I'll take the poor performance and three points." "We're all very hurt. It's so disappointing when a huge error gives Birmingham the opportunity to score their goal. "Overall, I was very pleased with the way we played. For large periods, we bossed it but we couldn't find the finish. We just could not find the final ball. "I would have liked to talk to the referee, but we have a cooling-off period after the game when we're not allowed to talk to him, and that's probably in his best interests." Match ends, Birmingham City 1, Cardiff City 0. Second Half ends, Birmingham City 1, Cardiff City 0. Attempt missed. Scott Malone (Cardiff City) left footed shot from outside the box is high and wide to the left following a set piece situation. James Vaughan (Birmingham City) wins a free kick on the right wing. James Vaughan (Birmingham City) wins a free kick on the left wing. Corner, Cardiff City. Conceded by Tomasz Kuszczak. Attempt saved. Scott Malone (Cardiff City) left footed shot from the left side of the box is saved in the top right corner. Assisted by Sammy Ameobi. Tony Watt (Cardiff City) is shown the yellow card. Stephen Gleeson (Birmingham City) wins a free kick in the attacking half. Attempt saved. Demarai Gray (Birmingham City) right footed shot from the right side of the box is saved in the centre of the goal. Attempt missed. David Davis (Birmingham City) left footed shot from the left side of the box misses to the right. Attempt blocked. Demarai Gray (Birmingham City) right footed shot from outside the box is blocked. Assisted by Maikel Kieftenbeld. Attempt missed. Jacques Maghoma (Birmingham City) right footed shot from the right side of the box is too high. Assisted by Paul Caddis. Attempt missed. Demarai Gray (Birmingham City) left footed shot from the left side of the box is high and wide to the left. Assisted by Greg Halford with a headed pass following a corner. Corner, Birmingham City. Conceded by Scott Malone. Substitution, Cardiff City. Peter Whittingham replaces Aron Gunnarsson. Substitution, Birmingham City. Greg Halford replaces Shane Lowry. Attempt missed. Tony Watt (Cardiff City) right footed shot from the right side of the box is high and wide to the right. Assisted by Kenwyne Jones with a headed pass following a corner. Corner, Cardiff City. Conceded by Jonathan Spector. Attempt missed. Sammy Ameobi (Cardiff City) left footed shot from the right side of the box misses to the left. Assisted by Tony Watt.